Come on, folks! You know that Leroy Parris was the godfather to one of Prime Minister Thompson’s children. 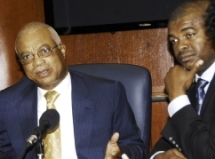 You know that Thompson was CLICO’s lawyer. 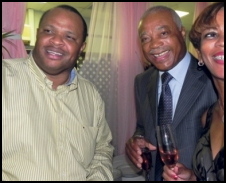 You know that CLICO gave oodles of money to the Democratic Labour Party and let them use the corporate jet. You know that as a lawyer Prime Minister David Thompson money-laundered funds from CLICO to Leroy Parris. That’s what the auditors say. We poor CLICO policy holders are suckers. The poor taxpayers are suckers. Forget about your children’s futures and education: you and your children will be a long time paying (it’s called ‘bailing out’) the elites who built that Ponzi house of cards called CLICO. I’m sure there’s some good legal reason why High Court Justice Kaye Goodridge ordered the Barbados Police to put the CLICO criminal charges on hold. Always is some good legal reason for doing what is done. It’s just that we predicted this months ago. Futures destroyed, pensions gone, lifetimes of work and savings stolen… and nobody will ever pay. Nothing changes ’bout hey. Nothing. Ever. Changes.